June 10 – At the International Land and Airland Defence and Security Exhibition Eurosatory 2016, to be held on 13 – 17 June, 2016 in Paris, Rosoboronexport (part of the Rostec State Corporation) will display Russian military hardware, as well as hold talks with the European partners. “At Eurosatory, we traditionally present armored vehicles, missile and artillery systems, close assault weapons and ammun…ition, key air defense weapons, diverse engineer equipment as well as some helicopter models. This year we’ll focus also on a variety of counter-terrorism equipment and conduct presentation of our new project, “Integrated Security Systems,” said Igor Sevastyanov, Rosoboronexport Deputy Director General, who leads the joint Rostec-Rosoboronexport delegation. Rosoboronexport expects keen interest in the various versions of the BMP-3 IFV, T-90S and T-90MS tanks, Smerch multiple rocket launch system, BTR-82A APC, SPM-2 GAZ-233136 special police vehicle, Pantsir-S1, Taor-M2KM and Buk-M2E SAM systems, Ka-52 and Mi-28NE attack helicopters. 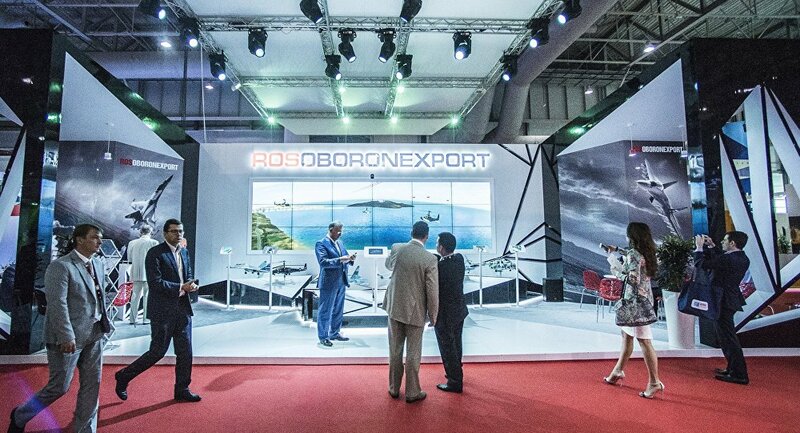 During the exhibition, Rosoboronexport will hold scheduled talks with its European partners. The Company also expects to meet with delegations from Southeast Asia, the Middle East and North Africa and Latin America. “Despite the tense geopolitical situation, we are in contact with our European partners, who are interested in developing cooperation with Russian industrial enterprises Our task is to keep track of events and be ready for any development of the situation. In addition, Eurosatory is an excellent platform for analysis of trends in the global arms market and contacts with delegations from all regions of the world,” said Igor Sevastyanov. Rosoboronexport is the organizer of the Russian exposition. Russian exhibitors will also include NPO Splav, Kalashnikov Concern, Schwabe Holding and Proekt-Technika Corporation. Rosoboronexport is the only state-owned arms trade company in the Russian Federation authorized to export the full range of military and dual-purpose products, technologies and services. It is a subsidiary of the Rostec Corporation. Founded on 4 November, 2000, now Rosoboronexport is one of the leading world arms exporters to the international market. Its share in Russia’s military exports exceeds 85 percent. Rosoboronexport cooperates with more than 700 enterprises and organizations in the Russian defence industrial complex. Russia maintains military technical cooperation with more than 70 countries around the world. Sergey Goreslavsky, Russian state arms exporter, Rosoboronexport, said that Rosoboronexport signed over 1,300 contracts in 2015. The Russian state arms exporter, Rosoboronexport, concluded over 1,300 contracts on the weapons delivery in 2015, the company’s deputy director general said Friday. “Last year, we signed over 1,300 contracts,” Sergey Goreslavsky told Rossiya 24 television. On November 2, 2015, Rosoboronexport’s Director General Anatoly Isaykin said the agency would maintain annual arms exports levels at $12-13 billion until at least 2017. These levels would allow Russia to retain the second place after the United States in exporting weapons, Isaykin added. On December 14, 2015, the Stockholm International Peace Research Institute (SIPRI) published its annual report of the world’s 100 largest arms manufacturers, ranked in terms of sales, where it said that in 2014 Russian arms industry’s sales continued their upward trend, despite difficulties in the country’s economy, caused by Western economic sanctions.The report said that at least 11 Russian arms manufactures were included in the top 100 for 2014, and they accounted for 10 percent of the total arms sales of the 100 firms. QUITOL (India), March 29. /TASS/. Foreign customers, in particular, some Middle East countries, are showing increased interest in Russian-made Sukhoi Su-34 fighter-bombers after Russia’s air task force successfully accomplished its anti-terror missions in Syria, Deputy CEO of Russia’s state arms exporter Rosoboronexport Sergey Goreslavsky said on Tuesday. 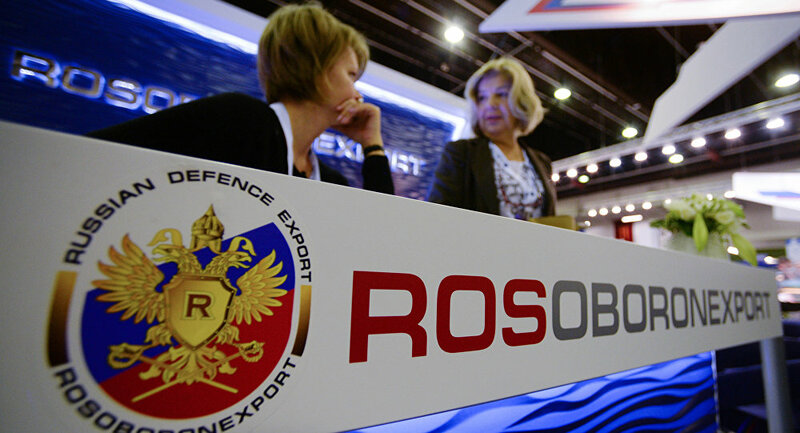 “No doubt, the interest has increased and I want to say that dozens of Rosoboronexport delegations are on foreign trips weekly and a very intensive process of negotiations is under way with countries from the Middle East, Africa, Latin America, Asia and so forth,” Goreslavsky said at the Defexpo India-2016 arms show. 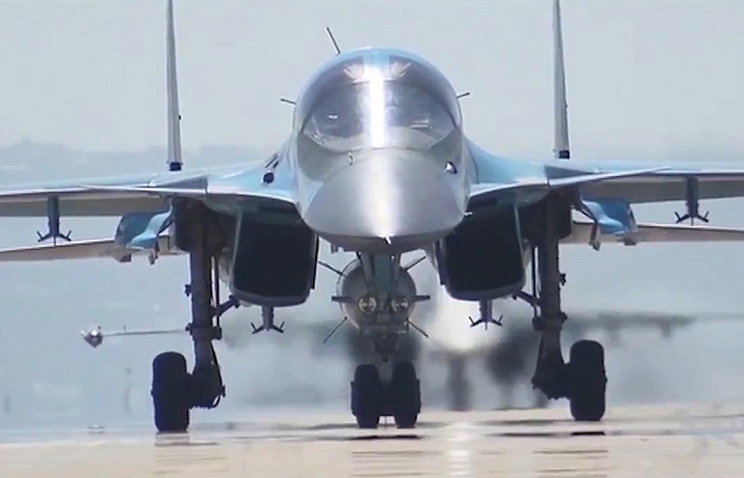 “Following the results of this operation [in Syria], the interest in Su-34 bombers has increased. Several countries are showing the most substantive interest in this machine. They are from the Middle East but I won’t name them,” he said. The Rosoboronexport deputy CEO said the Russian state arms exporter had initiated work a year ago to prepare an export configuration certificate for the Su-34 bomber. Russia started its operation in Syria on September 30, 2015 at the request of Syrian President Bashar Assad to fight militants of the Islamic State and other terrorist groupings in the Arab country. The operation involved the Russian Aerospace Force and Navy. It was also reported that Russian special forces were involved in the Syria operation. Russia deployed some most advanced military hardware at the Khmeimim airbase in Syria, including Su-34 bombers and Su-35 fighter jets. Russia withdrew the basic contingent of its forces from Syria from March 15 but its air task force continues delivering strikes against terrorists. Rosoboronexport Deputy Director Sergei Goreslavsky said that India is willing to develop its own defence industry in accordance with the ‘Make in India’ programme and could cooperate with Russia’s state arms exporter Rosoboronexport. MOSCOW (Sputnik) — Russia’s state arms exporter Rosoboronexport plans to discuss Russian-Indian cooperation in modernizing India’s defense industry within the Make in India program, the company said on Wednesday. “India is willing to develop its own defence industry in accordance with the ‘Make in India’ programme. We are ready to propose new large-scale projects for implementation in the interests of all military services with the most extensive involvement of Indian businesses, of relevant technology transfers and organisation of joint and license productions,” Rosoboronexport Deputy Director Sergei Goreslavsky said in the company’s press release. Discussions will take place on March 28-31 during the Defexpo India 2016 international land and naval systems exhibition to be held in Naqueri Quitol in India’s state of Goa.Rosoboronexport will present the T-90MS main battle tank, the BMP-3 infantry combat vehicle, Kalashnikov assault rifles of the 100th series, air defense systems, including those mounted on Indian-made Tata chassis, as well as numerous navy vessels, according to the press release. Russia and India have enjoyed mutually beneficial strategic relations, especially in the field of defense and military cooperation, since the 1960s. MOSCOW, January 21. /TASS/. The aircraft order book of Russia’s official arms exporter Rosoboronexport is worth more than $22 billion, the exporter’s press office told journalists on Thursday. “The worth of the aircraft orders landed by Rosoboronexport is over $22 billion. Foreign customers, including those in the Middle East and North Africa, have displayed increasingly keen interest [in Russian warplanes],” Rosoboronexport Air Force Materiel Export Department Chief Sergey Kornev was quoted by the press office as saying. According to Kornev, this is owing to Russia having brought advanced aircraft models onto the global market and to the high effectiveness of the latest Russian combat aircraft. “The increase in demand has been facilitated by the [Russian aircraft’s] cost effectiveness and by Russia’s reputation as a reliable and responsible partner in military technical cooperation,” he said. The press office reminded that Rosoboronexport would take part in the 4th Bahrain Airshow (Bahrain Airshow 2016) slated for January 21-23 at Sakhir air base. The arms exporter is planning a discussion of the feasibility of Russian aircraft sales, and its delegation will negotiate with representatives of the Middle East and North African militaries interested in Russian fixed-wing and rotary-wing aircraft and air-launched weapons. India could purchase more than $7 billion’s worth of weapons from Russia, local media reported Monday. In late November, the Indian Foreign Ministry told Sputnik that Indian Prime Minister Narendra Modi was scheduled to visit Moscow on December 24-25. According to the Kommersant newspaper, breakthrough deals in the military-technical sphere could be expected from Modi’s visit. The total package of contracts is estimated to be worth more than $7 billion. A source close to the Indian Defense Ministry told RIA Novosti last week that an agreement on joint Russian-Indian production of Ka-226T helicopters was likely to be signed either during or after Modi’s visit. An ambassadorial source told the media outlet that India’s arms purchase committee had approved the purchase of five S-400 air defense systems which could be worth around $5.8 billion.Russia and India have enjoyed mutually beneficial strategic relations, especially in the field of defense and military cooperation, since the 1960s. Russia is among India’s foremost weapons suppliers. Over two-thirds of the Indian Army, Air Force and Navy military equipment is Russian- or Soviet-made. Anti-Daesh military operation in Syria became probably the most important event in the world involving the Russian Armed Forces. 2015 has certainly been an eventful year for the Russian Armed Forces at home and abroad.On September 30, acting at the behest of President Bashar Assad, Russia launched an airborne campaign against Daesh (ISIL/ISIS) forces in Syria – the first military operation against terrorists abroad in Russia’s recent history. The campaign is being waged by the elements of Russian Aerospace Forces and Russian Navy, by carrying out bombing runs and cruise missile strikes without coming into direct, face-to-face contact with the militants. Russian aircraft, including Tu-160 and Tu-95MS strategic bombers, warships of the Russian Caspian Flotilla and Rostov-on-Don submarine have dealt a serious blow to the terrorists’ infrastructure, destroying numerous command posts, supply dumps, makeshift weapon factories, and wiping out scores of militants. Russian forces also targeted Daesh’s primary source of income – the illegal oil trade – by targeting oil wells, refineries, pumping stations and tanker trucks used to ferry the ‘black gold’ to prospective buyers. The operation was marred however by a tragic incident when a Turkish F-16 fighter plane downed a Russian Su-24 bomber over Syrian soil. The pilot was gunned down by militants as he was parachuting to safety, but the co-pilot was rescued during a joint operation mounted by Russian and Syrian forces. Another Russian marine was also killed during the rescue operation itself.The Russian military itself is undergoing a rapid modernization, with up to 47 percent of its total number now outfitted with modern equipment. The Strategic Aviation of the Russian Nuclear Forces was bolstered by the addition of ten new aircraft – two Tu-160, three Tu-95MS and five Tu-22M3. Also, a new Russian strategic command aircraft based on the Il-80 design – an analogue of the US ‘Doomsday Plane’ – was successfully tested and is about to enter service. The naval component of the Russian nuclear triad was supplemented by two new nuclear submarines – Alexander Nevsky and Vladimir Monomakh – while the ground strategic nuclear forces received five new regiments of RS-24 Yars ICMB launchers. The Victory Day Parade, held on May 9th at Moscow’s Red Square, also became an impromptu display of the newest additions to the Russian military arsenal, including the now-iconic Armata tank, Kurganets-25 IFV, Tigr and Typhoon armored vehicles, and many others. The Russian military also continued its buildup in the Arctic regions of the country, establishing new military installations and renovating existing airfields. The development of the Arctic military infrastructure remains one of the top priorities for Russia.This year, the Russian Armed Forces were also subjected to a great number of planned and surprise drills, testing the combat readiness of virtually all branches of the Russian military. Also, this year saw the conclusion of what some refer to as ‘the Mistral affair’. In June 2011, Rosoboronexport and the French DCNS naval defense company signed a contract for two Mistral amphibious assault ships and related services, including logistics, personnel training and technology transfers. Under the 1.2-billion euro contract ($1.35 billion at the current exchange rate), Russia was to receive the first of the ships in 2014 followed by the second in 2015. However, the sale of was cancelled by France because of Russia’s alleged involvement in the Ukrainian crisis. After Russia and France terminated their contract in August, Moscow received around $1 billion (949.8 million euros) in compensation. France has since made an agreement with Egypt, which bought the two vessels for about 950 million euros.